In contrast to an art gallery, a barn is designed more for efficient storage than for carefully poised display. Rachel Foullon has transformed the white space of ltd los angeles into an uncannily refined vision of a barn, and filled it with artworks old and new, some rescued from her archive and some made specially for the exhibition. As such, the commercial gallery, reconceived as a gruffly pragmatic storage facility, becomes something of a parody of itself. Foullon is wittily candid about the fate of previous artworks: some, recognisable from her exhibition two years ago, have evidently failed to find a buyer. 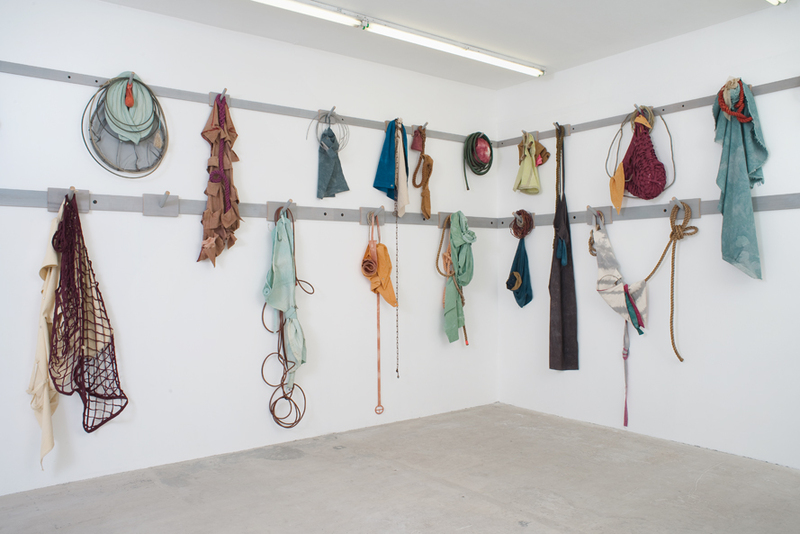 For instance, Foullon has reconfigured the work Commensurate with Modern Progress (2010) – consisting of a hand-sewn aquamarine horse blanket – with rope and a plastic dog muzzle to make Cluster (Commensurate with Modern Progress) (2012), which she hangs on a peg as if waiting to be reinstalled. Cedar planks run along the gallery walls, along which cleats and pegs can slide. Thus, if Foullon chooses, she can push all her pegs (and hanging artworks) into the corner in order to make space for more. It is not clear whether this would ever actually happen – which reveals a paradox within Foullon’s work. While these ‘Clusters’, as she terms them, all appear to be made from worn and faded materials, most of them have been sewn and dyed specially. Foullon references the gritty masculine aesthetics of the American West, but does not convince us that her tough and resistant artworks have – or ever would – be put to use. Instead, the abiding image is of a cleaned-up, idealised countryside seen through the eyes of Ralph Lauren or the chief designer at Pottery Barn. Probably, this is Foullon’s intention: not to relate the grim history of the American rural experience, but to ask why nostalgic stirrings are invariably aroused in city-dwellers by lassos and leather chaps. Moullon’s investigation is at its most complex when she connects the centuries-old struggles of Western settlers with late-Capitalism’s predilection for stone-washed denim and work boots.